Explore the delicate flavor and the heady aroma of the World's best Ceylon Cinnamon Powder from the Island of Sri Lanka. USDA Certified organic and imported in small batches to maintain freshness. 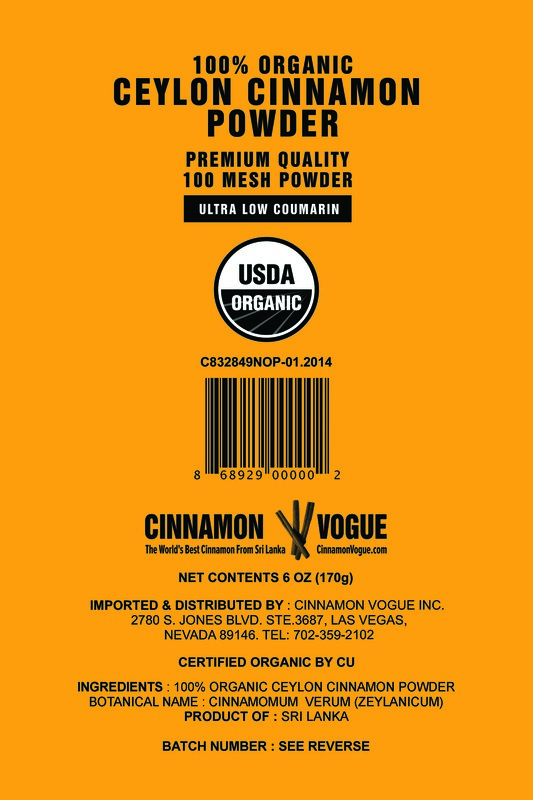 A high quality 100 mesh cinnamon powder. That makes it silky smooth on your tongue with none of the grittiness of other Cinnamon powders. Perfect to add into tea or coffee. Maybe sprinkle a little on sliced apples, orange or watermelon. Even better in an Apple Blackberry smoothie. But it comes into its own in hot pancakes or Cinnamon French toast as the heat releases the aroma into the air and waters your mouth. Packed in a triple layer stand up pouch with an oxygen barrier. That means it is protected from sunlight, moisture and high heat to keep it fresh for a longer period of time. A premium zip lock seal makes it easy to open and close without the frustration of a torn bag. The stand up pouch makes it easier to store and takes up less space. This powder is cool (not cold) ground into a fine 100 mesh powder. Grinding in an air cooled grinding machine ensures more of the flavor and oils are preserved. This 100 mesh powder is finer than ground cinnamon powder. That means there is far less grittiness and makes it easier to add to your coffee, tea, fruits and baked goods. Taste - Delicate subtle flavor (very mild taste) with notes of cloves and citrus. Not overly spicy and harsh like Cassia Cinnamon but unmistakably true Cinnamon. Blends well with many ingredients to create rich multi layered flavors. Aroma - Refined subtle fragrant aroma especially when heated and used in hot food like pancakes, cakes, muffins and French toast. Common Uses - Marinate meats, for stews, add to tea, coffee, sprinkle on fruit (especially Apple, citrus orange, tangerines and watermelon) make fruit smoothies, specialty cocktails, pancakes and French toast. Daily maximum dosage of Cinnamon per serving according to the US department of Health is 6g (1.25 tsp) or less for a maximum of six weeks. 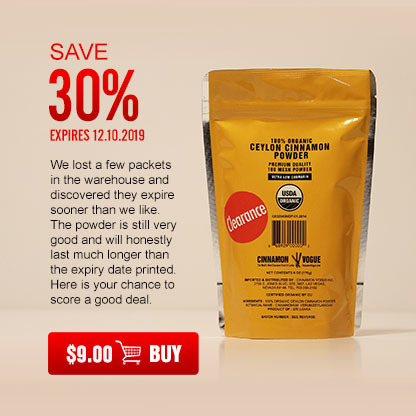 Ceylon Cinnamon has ultra-low coumarin levels. Ordinary Cassia Cinnamon available at your grocery store has high levels of Coumarin that can damage your liver. 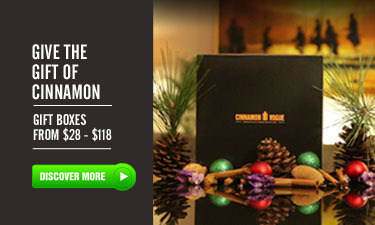 Click here to learn more about Coumarin in Cinnamon. Not available for Nevada - Due to tax reasons we do not ship to any destination in Nevada either via our web site or on Amazon. Orders received via Amazon will be cancelled. Our deepest apologies. My old cheap cinnamon can was rusting in the cupboard. It was time for a replacement. Now you might find it strange but when it comes to commodities I prefer the basest or the most exotic, but nothing in-between and between taint neither this nor that. So it was time to purchase. I read and re-read articles. Now I am not interested in the health benefits of cinnamon. I just want to be sure I am getting the best bark for my buck. 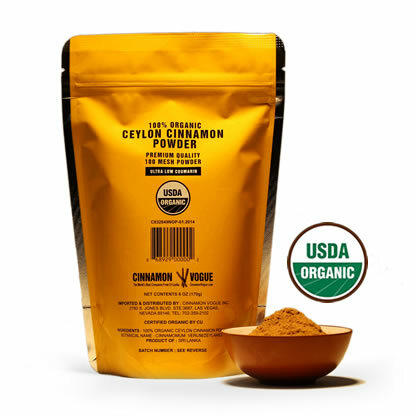 This Ceylon Cinnamon Powder is what it claims to be and is well worth the cost. It was a bit of a shock at first look as I did not realize that it is really powder and not little ground bits. Next it is a tad on the subtle side as is mot most quality products. But once you use it you will never go back. Unless you are a heath nut or do a lot of baking this package will last until you are ready for a fresh one. 5.0 out of 5 stars - Outstanding. This Ceylon cinnamon is outstanding in my opinion. I purchased this to help control my blood pressure but got a very pleasant surprise...it tastes great! I use it on deserts, coffee, black tea, and have even added it to juice. This is true cinnamon, which is very different from the cinnamon you buy in the store. It is aromatic, sweet, and does not overload your liver. I love this stuff! 5.0 out of 5 stars - Delicious & Uber-Yummy Scent! First time I've been wowed by cinnamon. The scent of this product is incredible and the taste profile...mmmmmmmmmm! I love this ceylon cinnamon powder & the tea bags. the company, Cinnamon Vogue, is easy to work with & informative. Excellent. Love this product. Will buy again. Fast delivery.